Minneapolis has a well deserved reputation for being a destination for “North Country” restaurants, though it isn’t as well known as food cities such as New York, Chicago, New Orleans or Seattle. From the downtown area to its many neighborhood, chef-owned restaurants, Minneapolis’s food scene features everything from high-end dining to low-end dives. In the summer, restaurants open street or rooftop patios, providing patrons with opportunities to people-watch, admire the Minneapolis skyline or enjoy a lake view. What connects such different restaurants as Butcher and The Boar and the Herbivorous Butcher is a dedication to locally sourced and carefully produced dishes. When you mix a bit of international influence and a bit of “Minnesota nice,” you get restaurants like SpoonRiver and the Birchwood Cafe. Great exemplars of the Minneapolis farm to table movement, these establishments offer menu selections to please everyone in your dinner party. Since Minneapolis has such a diverse number of dining opportunities and because many of us rely on our mobile phone apps to forage, this guide does not attempt an exhaustive list of where you can eat nor does it reveal how each restaurant is rated on yelp. The best restaurant lists published by local papers are always a good resource, but sometimes what you need to know is where you can go given the time you have, your budget, the proximity of the hotel, and the food interests of your friends. So, this guide identifies four areas ranging from one block to five miles from the conference hotel. It then provides the names of restaurants, a brief description of their menu or specialties, and an embedded hyperlink so you can investigate whether or not you would want to visit. This approach will miss some great places, but by clicking the links in this guide, you can browse menus, find phone numbers, get directions, and decide for yourself where your next meal should be. The downtown of Minneapolis is filled with commercial enterprise but that doesn’t mean that there aren’t some great places to have a meal. If you are looking for breakfast outside of the hotel that doesn’t involve either a “star” or “bucks,” you might try Hell’s Kitchen on 9th St. or Keys Cafe at The Foshay, Eggy’s Cafe or Hen House Eatery. Each of these eateries is known for their breakfasts, but they also serve meals beyond the morning hours. There are a lot of inexpensive lunch possibilities around the conference hotel. One block over from the Hilton is Nicollet Ave., a walking and public transportation mall. On the first and second floors of the buildings that line Nicollet, you will find the usual chains—Leeann Chin, Subway, Panera Bread, and Bruegger’s Bagels. But perhaps you want to consider something different but still fast. Every Thursday from 6:00 AM to 6:00 PM, Nicollet Ave. hosts a Farmer’s Market between 6th and 8th Street. Think of the Farmer’s Market as a benefit to those who arrive for the first day of the conference! Sprout Salad Company at 555 Nicollet Mall in the RBC Plaza is worth the walk. Vellee Deli makes Banh Mi sandwiches to order–tofu or pork–along with fish tacos and a veggie melt. The Greek Grill & Cafe is located in the Northstar Center and Sushi Takatsu has grab and go sushi from its location inside the building at 733 Marquette Ave. These restaurants all cater to the weekday business crowd and may not open Saturday or Sunday. There are several choices for folks who want lunch or dinner in an English/Irish-style pub, as well. 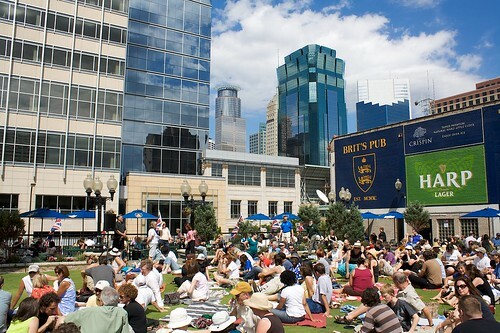 If the weather is nice, you will definitely enjoy a pint of Guinness, some Scotch Eggs, and a round of lawn bowling (yes, you read that right) on a perfectly manicured terrace at Brit’s Pub. Kieran’s Irish Pub has been around for decades, and it is well worth the stop if your looking for lunch specials. The most interesting entry in this category is Dan Kelly’s Pub, which plates contemporary interpretations of traditional Irish food. Consider, for example, the Forager sandwich (sautéed crimini mushrooms, leeks, and fontina cheese), a turkey burger with apple chutney or a marinated chicken club sandwich, each for less than $14. If you are looking for a dinner before or after an RSA plenary event, there is a lot downtown from which to choose. Butcher and The Boar is still one of Minneapolis’s hottest restaurants for diners who want to try their locally sourced and smoked meat. Despite its $30 to $60 plates, it tends to be busy so reservations are recommended. BtB is not the only place to get a ribeye downtown. Murray’s Steakhouse and Manny’s Steakhouse have been fighting for decades over who offers the best steak in an atmosphere that would make Frank Sinatra feel at home. Not to be outdone, Seven Steakhouse & Sushi has re-invented its menu to appeal to folks who want a quality steak in a rooftop setting without all that deep leather and wood. For those of us who don’t enjoy answering the question, “How would you like your steak done?” there are a number of restaurants to consider. Zelo is a popular Italian restaurant that serves excellent food and wine pairings. 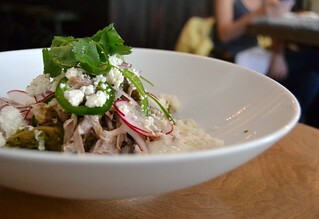 The News Room has an extensive menu and a patio that overlooks the Nicollet mall. Cafe Lurcat is a walk at one mile, but its elegant white table-cloth atmosphere and American Bistro menu, is worth it. Situated just off of Loring Park, it is a nice place for a couples dinner. If your taste runs more to drinks and small-bites, you might enjoy The Local. Its only a couple blocks from the hotel, which makes the walk back to your bed just that much sweeter. Prohibition Bar in the W Hotel under Foshay Tower serves up that red velvet lounge feel for those of us who like the decor of a bar to match the color of our drink. Approximately one-half to one and a-half miles from the conference hotel are two areas that offer diverse eating opportunities. In the Warehouse District, 112Eatery sits on the higher end of the spectrum. Its comfortable intimate atmosphere, especially for parties of two or four, and an excellent menu make it worth the trip. In a similar food-style and price but with a more airy atmosphere, Spoon and Stable serves Great Lakes trout, tamarind glazed pork chops, and chilled foie gras. If these restaurants sound a little too “French” for your taste, try The Bachelor Farmer. The price of an entrée will still reach $35, but its menu features “fresh and simple food that honors Minnesota and the surrounding Northern region.” Hey, and there are afghans on the walls! Think farm to table to wall. The warehouse district also is home to relaxed, less expensive fare. Two great pizza places, Black Sheep Coal Fired Pizza and Pizza Luce are terrific if you are a party of one or a party of eight. Reasonable sandwiches and wraps are available at the Loon Cafe. Try Dong Hae Korean Grill and Sushi for Korean BBQ, and Red Cow Restaurant & Bar for gourmet burgers and craft beer. Finally, the Smack Shack offers the same relaxed atmosphere but with seafood dishes like lobster mac and cheese. These Warehouse District restaurants are a lot of fun and can be easier on the food budget. As you travel toward the home of the Minnesota Vikings, your food options change once again. Zen Box Izakaya, Sawatdee Thai restaurant, Kindee Thai and Wasabi Sushi Fusion all exist within a three block radius along S. Washington Ave., one mile from the conference hotel. Zen Box Izakaya serves “Japanese Comfort Food.” Sawatdee Thai has been at their current location for years and is a great spot for the whole family. Kindee Thai is the new kid on the block, located just across from the Guthrie Theater. Finally, Wasabi Sushi Fusion is exactly what you might expect. They offer a large selection of sushi tailored to the diner who wants to “try” a caterpillar roll, but is likely to have chicken for dinner. As you proceed east on Washington Ave. toward the stadium, you will hit a concentration of restaurants, bars, and pubs that specialize in craft beer. The Day Block Brewing Company restaurant and tap room serves its own beer, a nice food menu, and, many nights, live music from 8PM to midnight. Town Hall Brewery, located next to the West Bank Campus of the University of Minnesota, was founded in 1997 when the craft-brew craze hadn’t yet reached Minnesota. If you want the taste of an original Minnesota craft-beer, Town Hall is the place. Republic and Acadia Cafe don’t brew their own, but they do have a wide selection of local and North Country offerings. Seasonal as well as the staple beers of Surly, Summit, Lift Bridge, and Lupulin are available on tap at these locations. You might have a hard time finding a tap with Grain Belt, however. Nestled into the “West Bank” are three more restaurants for your consideration. Baarakallah Restaurant serves authentic Ethiopian cuisine. The Red Sea offers Ethiopian and Eritrean food, altered slightly to appeal to Northern Midwestern tastes. The Acadia Cafe and Pub offers a nice selection of beer along with vegetarian and vegan friendly meals. If you travel South on Nicollet Ave. away from downtown, within two miles and stretching for approximately four miles, you find yourself on “Eat Street.” As one website explains, the aptly “named Eat Street section of Nicollet Avenue is an intriguing and often affordable area to get a full taste of all the different flavors of the Twin Cities.” There are many terrific restaurants that serve international and multicultural meals in St. Paul and Minneapolis, but this stretch of Nicollet contains one of the greatest concentration in the Twin Cities. For example, you can enjoy Jamaican food at Pimento Kitchen, 2524 Nicollet or Harry Singh’s Caribbean Restaurant, in the next block at 2653 Nicollet. If you are in the mood for soup, try Pho 79. Keeping with the Vietnamese theme, the Jasmine Deli offers rice paper spring rolls, vermicelli dishes, and traditional Banh Mi sandwiches, perfect for a lunch away from the hotel. If you’re looking for a Greek dinner that the whole family can enjoy, you can’t go wrong at Christos Greek Restaurant. Their shrimp Myconos is excellent, and the flaming saganaki cheese will delight the table. Twin Cities residents consistently vote the Rainbow Restaurant the best Chinese restaurant in Minneapolis, although the food critics at CityPages prefer “Jun,” which is located back in the Warehouse District discussed earlier in the guide. The restaurants identified so far comprise less than half of the places you could visit on Eat Street if you had several weeks to explore. It is hard to resist the dinner or dessert menus at The Copper Hen Cakery and Kitchen. The Icehouse is an open-air bar and restaurant with an industrial flair; try the patio or upstairs. Please seat yourself at The Bad Waitress Diner & Coffee Shop, because no one will wait on you. Order, pay, move on. Situated between Lyndale Ave. and East Calhoun Parkway along West Lake St., the Uptown area of Minneapolis is a vibrant mix of young professionals, cool urban families, and established homes. If you want to escape downtown and see one of those lakes that everyone is always talking about, this is the direction you should go. Lake of the Isles and Bde Maka Ska (formerly Lake Calhoun), run along the western edge of Uptown. After a stroll along the lake, visit Barbette for refined, modern French cuisine. For Chicago style pizza that will please children and adults alike look for Giordano’s on Hennepin Ave. If you (or your fellow diners) would rather eat pistachio gnocchi than a deep dish pizza, then the Italian restaurant, Amore Uptown, will be more to your liking. Namaste offers a Nepali menu that is vegetarian friendly. Looking for a meal and a place to read? Here are three great options. The first is a bar with great taps and good food away from the conference crowd. Muddy Waters Bar & Eatery has a loyal following of regulars. If pastries are how you prefer to ingest your bread, then try the second option. The French Meadow Bakery & Cafe is a local favorite with two distinct personalities. You order at the counter and grab a table during busy breakfast and brunch hours or visit in the evening for cloth-covered tables and fine dining. The cafe behind door number three allows you to choose among a cappuccino, a wild rice burger or a craft beer. Common Roots Cafe is the best choice for any graduate student who is putting the finishing touches on their RSA presentation. Seafood and excellent sushi are available at a number of places in Uptown. Stella’s Fish Cafe offers fresh seafood, an oyster bar, and a great rooftop patio with views of the Uptown neighborhood. Sushi Tango puts a contemporary, playful twist on the traditional bar-food, but Origami and Fugi-Ya are the undisputed Kaiju of Japanese cuisine in the Uptown area. You can’t go wrong with either of them. Finally, its always important to remember that the food business is hard. Not every restaurant makes it. If you want to visit an establishment that will be closing its doors soon after RSA leaves Minneapolis, pay your respects to Heyday. This well regarded eatery will be closing after the first week of June, so get yourself an “Angry Drink” cocktail, a Chicken Liver Tart, and some Gouda Mousee with honeycomb and tarragon before its all gone. The four areas described in this restaurant guide provide a cross-section of the options that exist in the Twin Cities. Of course, they don’t contain it all. You would have to travel a bit farther south to enjoy the Soul Food at Revival. The best Vegan restaurant right now is probably J. Selby’s, across the river in St. Paul. If you head East on Lake Street, you’ll eventually hit the Midtown Global Market, which combines an indoor farmer’s markets with international food and shopping. The best meals I’ve ever had in Minneapolis were in small spaces with chef-owners who fed mostly the locals who lived within a few blocks of their place. These restaurants have names like Tilia, the Chatterbox Pub, Terzo, Corner Table and Black Bird. These are the special places that make the food-scene in Minneapolis unique. They reflect the neighborhoods in which they reside and the culture of the people who live there. No doubt the residents of North Minneapolis, the Western Suburbs, St. Anthony Park or St. Paul would identify other restaurants that fit this bill. But if you decide to stay an extra day and night, these are the places to find. When I was a graduate student and early-career professor, one of my mentors, Michael Leff, taught me that the best places to eat are not the most expensive or even, always, the places with the best food or drink. The best restaurants are the places that encourage meaning. That meaning might come from the kitchen; it might derive from the restaurant’s atmosphere or location; it might stem from the host or the other patrons with whom you shar a meal. What’s important, what makes a restaurant experience “good” is that it encourages you to craft some meaning out of the experience. Mike wouldn’t have liked all of the restaurants identified in this guide, but he certainly would have liked many of them. So, in his honor, let me end by saying that I hope you make some meaning over a good meal while you are in Minneapolis.